This is a tasty way to do up Chicken Tenders. The coconut adds a sweet and crispy touch that is just right! While these are unique restaurants, with the animation, you may not be able to get to this restaurant anytime you like. What you can do is to try our version of this recipe out of your own kitchen. Make Rainforest Cafe Caribou Coconut Chicken just like they do with our recipe. Trim chicken breast so the pieces will measure 4" long and about 2 1/2" wide. Sprinkles sugar and salt over chicken breast and place in a ziplock bag and marinate in the refrigerator for 4 hours. When chicken breast is ready to be prepared, rinse lightly and drain. Place coconut, cornstarch, and flour in a bowl and mix well. In separate bowl place beaten eggs and add water, blend well. Have oil hot and ready to fry chicken breast. Dip chicken breast in egg wash and then place chicken breast in coconut mixture, coating well. Carefully place chicken in hot oil and cook until lightly golden. Remove and place on a paper towel. When frying chicken does not crowd and keeps a check on the oil so it does not burn. The coconut chicken was served with the honey mustard on top of the chicken pieces, we have elected to serve the sauce on the side. For presentation and tasty side compliment. Slice a ripe pineapple in 1/8" pieces and cut the round slices in half. Lightly sauté the pineapple in a nonstick saucepan that has been sprayed with a nonstick spray just until heated through. The pineapple will turn more intense yellow. 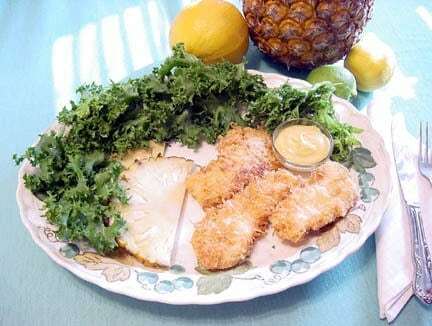 Serving fresh sautéed pineapple is also great with a pork entree. Can I use sweetened coconut and omit the sugar at the begining? Is hard to find unsweetened coconut… thanks! Tried this recipe and it was great! I would suggest using grated coconut instead of flaked so that the coconut won’t burn as quickly. I paired this with the coconut curry sauce. Delicious!